We are so happy you're here. Be sure to visit the "Welcome Aboard" kiosk in our front lobby with helpful information to ease your transition to Kings Bay Submarine Base and Crooked River Elementary School. Military Families! Did you know that if you live in base housing, there is a biker/walking path that leads straight from our school to the Child Development Center on Kings Bay Submarine Base? Parents can personalize the app with their baby’s picture and create a photo gallery of their child’s moods in Feeling Photos. 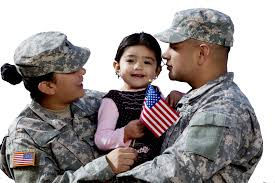 To make it even easier, parents can sort the information by their young child’s age and specify their situation as; at Home, leaving soon, deployed, home again, a veteran, or visiting a hospital. The app also allows quick access to a series of podcasts on parenting for military and veteran families. Babies on the Homefront was developed by ZERO TO THREE: The National Center for Infants, Toddlers, and Families through a generous grant from the Robert R. McCormick Foundation.